COMMENTS: These work out great! You can use with your printer at home or hand write on them for tester labels. "Way too hard to use. " COMMENTS: The labels may be fine, but if I use them I will have to use them for make-shift handwritten labels. I was so disappointed! The only way to use this is Microsoft word, with all of it's designing issues. I apparently have to manually type out (and align the text on) each label individually, and if I want to use clip art... yikes. Looks like hours of work for a page of labels. Most other companies make their labels compatible and interchangeable with Avery labels- then you can just use the Avery website to design and print in seconds. I cannot see using these. Maybe someone who is expert in computer design or Microsoft word can use these, but I can't. 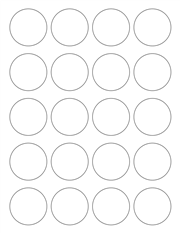 You can't even cut and paste from one "circle" to another within the template, so each has to be individually (and painstakingly) built. So frustrating. "Is there a template that goes along with these? " Staff Answer Yes, there is a template under the SDS & Documents tab. Click on the MS Word Document to download. Click on Enable Editing on the top and the template will be available to type on.